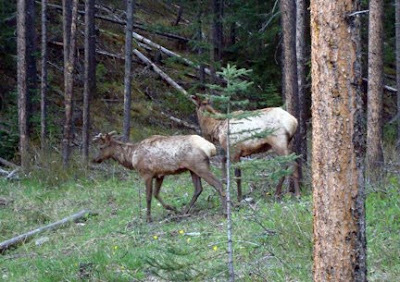 Living in a national park definitely means we're exposed to more wildlife than most. We are constantly checking to see what animals are on our front lawn as we leave the house or who's been hanging out in the neighborhood when we go for a hike. 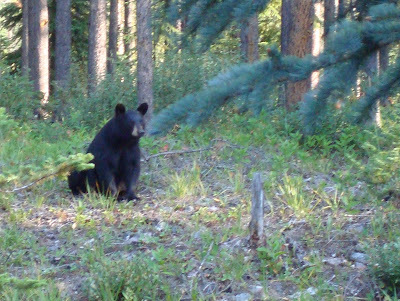 I've even actually heard a mother tell her two young boys, "if you see a bear, you come straight home." So, I thought I'd share the experience and show you some of our recent visitors. Pretty cute and cuddly looking, but I like to take pictures like these from the safety of my dining room window, because they aren't always as docile as they appear. They're just fencing us in at the moment, so we may actually lose this interaction with animals to some extent, but it may also save the wildlife from accidents on the highway and too much exposure to people, which usually kills them in the long run. The fence that circles our cul de sac and impedes our view out the back window kinda makes you wonder who are the animals in the zoo.